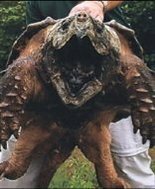 The iconic giant of Southeastern rivers, the alligator snapping turtle, is among 53 reptiles and amphibians that should be considered for protection under the Endangered Species Act, according to a petition filed Wednesday by the environmental group the Center for Biological Diversity. In addition to the alligator snapping turtle, the center's petition to the U.S. Fish & Wildlife Service includes four other species known to occur in Alabama: the green salamander, which is found in the crevices of rock formations along the Appalachian mountains, and three species associated with the longleaf pine forests of south Alabama: the Southern hog-nosed snake, the Florida pine snake and the Carolina gopher frog.